Anew Green Seed Pacs, patent pending, are an environmental growing solution developed to make planting easy. 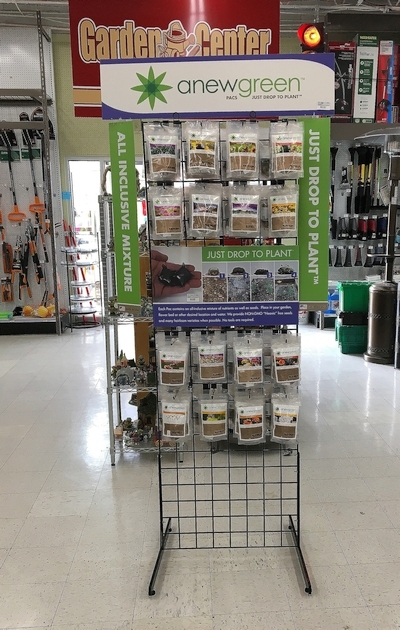 Each Pac is an all-inclusive environment containing seeds and nutrients, such as soil and fertilizer, which provide seeds the best opportunity to grow in a variety of soil conditions and locations. No more digging or transporting heavy bags of soil. No tools required. Just drop the Pac where plant growth is desired and water. The outer material of the Pacs will dissolve away only when moisture is applied. Our Seed Pacs are educational for those new to gardening, convenient for busy people, small-spaces and urban gardeners, and helpful for pollinators and land restoration. You can place Seed Pacs in planter pots and gardens, or toss randomly and let rain handle the rest. We provide non-GMO, neonicotinoid free seeds, which are heirloom whenever possible. Place Seed Pac on top of soil. Do not bury in the ground. Initially water to dissolve the outer material of the Pac and saturate the contents. For best results, continue to water daily, keeping contents moist, until germination occurs. Once growth occurs, continue to water as needed based on the type of plant and environmental conditions. For more detailed instructions, please read the information below. Flowers, Fruits, Herbs and Vegetables. Simply distribute pacs where desired. The pacs make it easy to space out where you want plants to grow. 1 pac typically covers 1-2 sqft once plants grow. Perfect for planter pots! Our Pacs make it simple to beautify roadsides or recover destroyed land. Just drop the Pacs in the desired location and let the climate handle the rest. Need a quote for customized Seed Pacs? Please contact us. If possible, let us know the type of seed and the estimated size of the area for your project. Seed Pacs are designed to fit specific soil conditions. Minimal land intrusion because our Pacs can be distributed by hand, material spreader, or by air. Place a Seed Pac on the ground at the desired location, do not bury. There’s no need to spend time tilling your soil unless you prefer. However, it’s best to plant in an area cleared of old growth so the seeds have access to soil once germinated, this will help sustain growth after germination. Be sure the area also provides the proper light. Once planted, water daily until germination occurs, keeping the contents of the seed pac moist. If you plant with the intent of letting nature handle the watering, just know it may take a longer amount of time to germinate. Indoor or outdoor in planter pots, flower gardens and garden borders, fields and open space. The best time to plant depends on the climate as well as the species you are planting. Annuals: Annuals perform an entire life cycle in one growing season. Some annuals reseed themselves and act as if they are perennial, which are known as Biennials. Perennials: Perennials will grow back year after year, but generally do not bloom until the second year as they need to establish their root system first. Our Seed Pacs make great year-round gifts! Help the pollinators by planting Anew Green Seed Pacs! What are seed pacs made out of?